Mila was destined to become the Truffle Huntress. 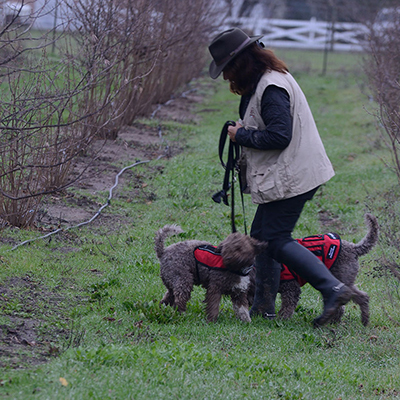 Hand selected for her pedigree and temperament by one of the top breeder’s in both the States and Italy, she was started using the Italian method of truffle dog training. At birth Truffle oil sourced from Jack Czarnacki of Palmer House Restaurant was placed on the mother teats, imprinting the truffle scent as the puppies nursed. By 8 weeks of age she was playing “fetch” with a truffle scented socks and at 12 weeks she was attending formal training at the Oregon Truffle Festival. She was the youngest pup to ever attend the training seminar taught by foreknown Elephant trainer turned Truffle Dog trainer, Jim Sanford and his trusty Truffle Dog, Tom of Blackberry Farms. That weekend in the frigid cold rain she found her first native Tuber Gibossum in the Oregon wild. It was the size of a pea which was appropriate for the pint size 3 month old, 6 lb truffle puppy. She was an intense focused little pip squeak of a pup that loved to work. So much so that if she wasn’t working or training she would become a hellion and torment and wreak havoc with her human and canine companions. From grabbing the remote for the TV and running off, to sniffing out cash and shredding it to pieces. She was relentless. She knew everyone’s hot button and she would torture her human teenage siblings by seeking out and destroying not only their shoes but bras, makeup brushes and their prized stuffed animals. The only thing that would wear her down was nose work and scent training. By 6 months of age her training included “ZOS” (Zielobjektsuche) training taught by Gertrude Gudron of Germany. 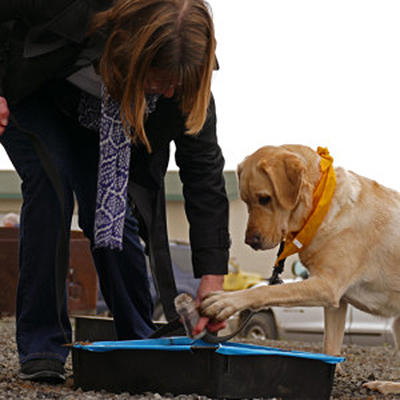 A law enforcement dog trainer who taught the techniques of target search scent to train Bomb and Narcotic dogs. 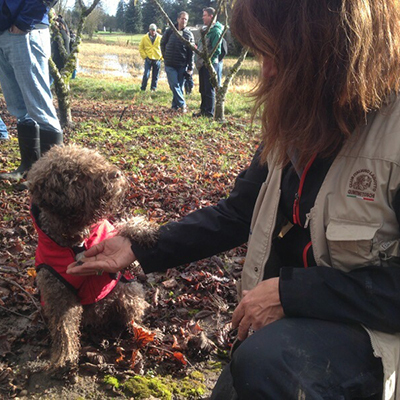 Mila excelled in her maiden truffle season funding native truffles in Washington, Oregon and California. By her second season Mila competed in the first U.S. Truffle Dog Competition, the Joriad where she came in 4th out of 30 dogs. The only dog to make the finals from California! Her first professional season, 2016, was an amazing year unearthing Perigords in both Oregon and California Truffiere’s. 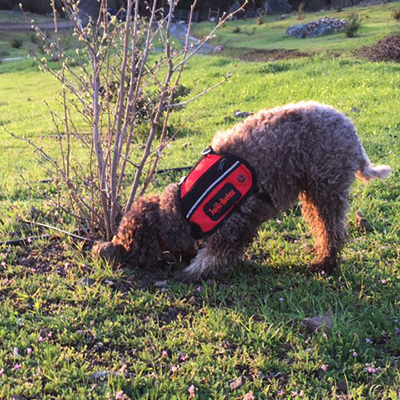 Mila was the first dog in over a decade to unearth a cultivated Perigord in Northern California See News. We look forward to what the next season will bring in both truffle harvests and new truffle puppies as she starts her own legacy of Truffle dogs for future Truffle farmers. It all started with a group of friends hiking and imagining what the “perfect job” looked like. You know- that job, the one where you could incorporate all of your passions. The one that wouldn’t seem like work at all. For me; Dogs, Hiking, Travel, Food, Wine, and Fishing. That dream job, including even the fishing, became a reality when I started looking for a new dog. Being an animal lover, I’ve always had multiple dogs in my life. I had grown up with all types from rescues to pure breeds. When it was time to add a new dog to the pack. I decided I was going to find the perfect dog that fit my life style. It seemed like a simple task: The characteristics of a Lab just a smaller non shedding version to simplify travel was all that I thought I needed. Google search criteria: Athletic, loyal, intelligent, non-shedding, medium sized working dog that loved water. Surprisingly there weren’t many dogs that fit the mold. 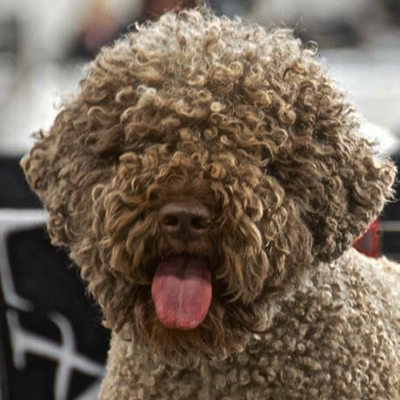 On the short list was a rare Italian breed the Lagotto Romagnolo. When I dug a little deeper (no pun intended), I found that this ancient breed was specifically bred to find Truffles. 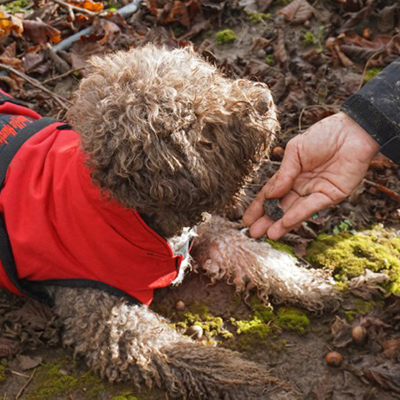 Being the only breed in the world specialized in tracking down this precious tuber – The perfect job started to come into focus and Truffle Huntress was realized. Hana, the yellow lab, had a career change after being dismissed from Seeing Eye Dog Guide training. When they “right sized” their program she was let go due to her over exuberance and inability to poop on command. After being relieved from her duties she found a new home where she was eager to acclimate back to being a regular old dog. She went right to work ransacking the garbage, jumping all over people, pulling on her leash and torturing her four legged house mates. She loved her new found freedom of just being a dog but her energy and mischief required a need away to burn off some energy. After refusing to go on runs with her owners she took up nose work and loved the challenge. Her intelligence, laser focus, eagerness to please and need to return to the work force will make her a rock solid truffle dog. She is in the final stages of her training and will be ready to report to duty in the fall of 2016. 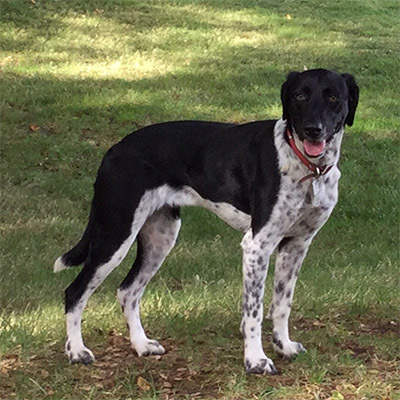 Georgie, the German Short Haired Pointer mix recognized that the third time was a charm when she finally found her current forever home. As a rescue she was repeatedly returned to various shelters due to her superb talents as an escape artist. Jumping 8 foot fences, chewing ropes, chains and leashes, and excavating herself to freedom were her favorite pass times to escape boredom. Luckily she was liberated from a kill shelter and assimilated into a family with 2 kids, 2 dogs, multiple cats, chicken and fish and she fit right in to the menagerie without a moment for boredom. She is a little skittish from her days in the pen but has a new found confidence in Truffle hunting and is a natural born hunter! She looks forward to getting out into the Truffiere’s and starting her career as a working Truffle Huntress. 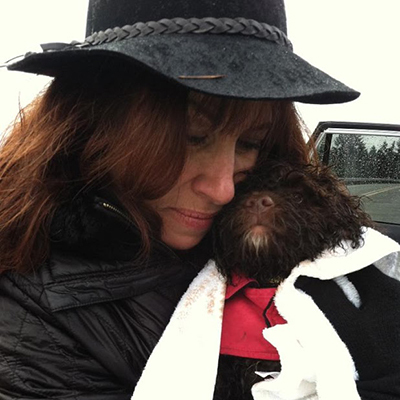 Staci O’Toole started Truffle Huntress in 2012 after the baby Truffle Huntress, Mila showed up on the scene. Before placing the puppy, the breeder required that she be trained as a working dog and advised that she would fail in a pet home due to her intensity, intelligence and drive. Staci agreed as she couldn’t imagine it would be that difficult or that she would have to surrender a puppy back to the breeder if she couldn’t handle a little furry 8 week 6 lb pup. Realizing she was now immersed in truffle hunting, Staci called upon her degree in Biological Sciences and began researching and learning about truffle cultivation and nose work. The Education and training took her throughout the United States and finally to Italy where she learned about the breed in its native home of Romagna, Italy. Here she was fortunate enough to attend Club Italiano Lagotto’s annual Rodundo at the Villa of Dr. Morsiani. 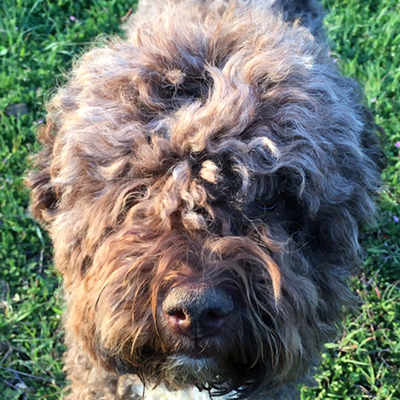 As one of the founders of the breed he was instrumental in establishing the Lagotto as a recognized pure bred specializing in truffle hunting. It was one of the largest gatherings of the breed at that time, they were judged in the show ring on morphological traits and working dog standards and aptitude in wild truffle patches. As a guest of her breeder she had the amazing honor of assisting in the truffle hunting aptitude test in the wild, which was normally closed to spectators. This was a once in a lifetime opportunity where she learned firsthand about truffle hunting in the wild. Upon returning to the states she continued researching and learning about truffle cultivation. She attended growers forums across the United States including the Oregon Truffle Festival, Napa Truffle Festival and North American Truffle Growers Association. Her education is scheduled to continue abroad as she studies the methodology and science of cultivation in Italy, Australia, Croatia and Spain. Her passion is driven by her love of dogs and the unknowns of the science of truffle cultivation as she hopes to better understand the business to assist the truffle production in her Truffiere in Northern California, Tesoro Mio. She plans to continue to learn and use this knowledge to serve as a trusted resource for her Truffle Dog and Truffiere clients. 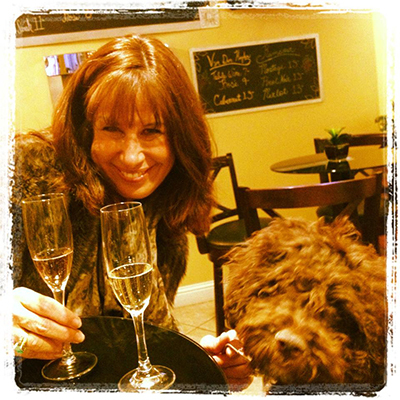 She is a professional member of American Professional Dog Trainers Association, North American Truffle Society, North American Truffle Growers Association, Lagotto Romagnolo Club of America, Santa Cruz Fungus Federation and serves on the Health and Research Advisory board for the Lagotto Romagnolo Foundation.